Please enjoy this Sample Version of our upcoming game! 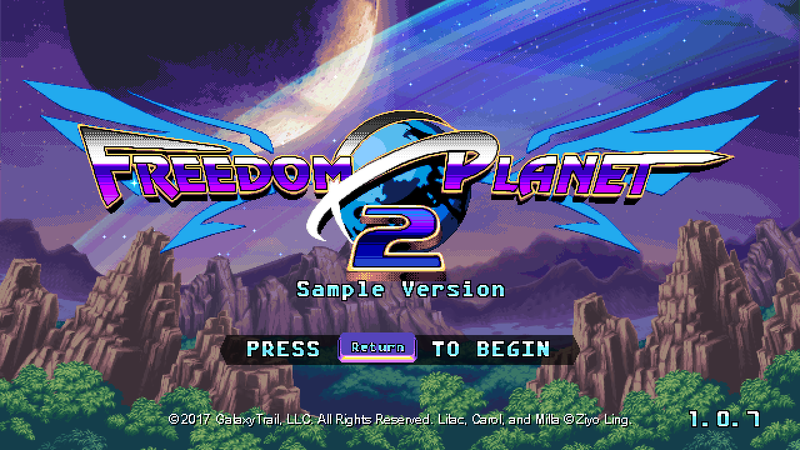 This demo includes a special build version of the level "Dragon Valley" and includes all four playable characters, a dozen items to set to create different difficulties and the first boss seen in the Freedom Planet 2 lineup! That's right! Thanks to a successful Greenlight Campaign we have our store page up early and the Demo is also available on Steam. Check it out while showing off to your friends that you're experiencing this cutting edge, razor sharp... err... very pointy... demo! Q: The buttons all seem wrong! I can't set them! A: Unfortunately for this build controller mapping isn't quite finished! Instead use the buttons as they are or go into the config and click "Set Default Buttons" for an alternate mapping including Mouse Controls. Q: Windows says your file is a virus / corrupt / not from a known developer! A: We apologize, some builds of Windows 10 aren't reading the publisher file correctly and we're fixing this. For now select to ignore the warning and run anyway. We promise Brevon didn't leave a virus on this! Q: The game runs way too fast! A: If you have a monitor with a refresh rate bigger than 60hz, try lowering it to 60hz or enabling Vertical Sync for your graphics card. Q: The Crystals are acting funny on the Mac Version! A: We suspect Brevon is behind this. We're currently launching Chaser ships to investigate!